Get double your jewelry shopping pleasure by buying jewelry for a cause at the National Eating Disorders Association "Every BODY Is Beautiful" Online Fundraising Auction event, which runs from November 1st through December 2nd, 2007. 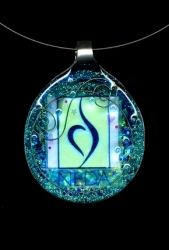 Along with this pendant from Spoonfed Art, featuring the NEDA logo, and jewelry from other designers, there are lots of other great items to bid on such as clothing, Tote bags, spa packages, beauty products, autographed collectibles, vacations, music, and books. The auction is open, and in less than one week, you have helped us raise nearly $7,000! Let's keep the momentum going by bidding on more great items to benefit the National Eating Disorders Association. We envision a world without eating disorders, and you can help make our dream a reality! Auction items range from exotic vacations and priceless celebrity memorabilia to countless items guaranteed to delight and surprise. The auction is open until December 2 so be sure to bid on all of your favorite items before it is too late. Sarah Peacock creates her jewelry with care, and as a way to expand on that notion, she offers customers a chance to send 5% of the proceeds from their purchase to a number of different charities such as the Human Society, lance armstrong foundation, and Susan G. Komen. Her jewelry is fine silver versus sterling silver, which means instead of being made of 92.5 percent silver it is made of 99.9 percent pure silver. Is there a big difference though? Yes, actually. With pure silver jewelry, you'll notice right away that it is much brighter than sterling. Another added benefit is that it doesn't tarnish as quickly. Here are a few of her hand-crafted designs to oogle over. June 2007 – During September and October, The Leakey Collection is donating 5% of its sales from a designated group of Zulugrassâ„¢ jewelry to Susan G. Komen for the Cure. In support of Breast Cancer Awareness Month, The Leakey Collection will introduce a limited-edition, multi-strand necklace specially designed by Katy Leakey, co-founder with husband, Philip, of The Leakey Collection, and handcrafted by the Maasai women in Kenya. Created from sustainable resources abundant in the Kenyan bush, The Leakey Collection reflects the natural elegance and beauty found in Africa. Five percent of sales from the multi-strand necklace, along with individual strands of pink Zululgrassâ„¢ beads from select pink colorways will go toward supporting breast cancer research. The company also will continue to put 5% of gross sales back into the community in Kenya for education, infrastructure, and medical needs, with a particular emphasis on the Women's Health Initiative. This September and October, the purchase of select Zulugrassâ„¢ jewelry not only gives the gift of opportunity to the Maasai women of Kenya, but it gives the gift of hope to women throughout the US whose lives have been touched by breast cancer. Mauri Pioppo definitely is trying to help a number of causes through her jewelry design skills, no doubt about it. Under her Karma link on her web site, she lists a number of jewelry items where part of the proceeds goes to various charities. This fine jewelry was created with the intention to generate support for animals in need. 15% of all profits from the sale of these necklaces will be donated to the aspca. Inscriptions on the back read: Give a Dog a Home, Give a Cat a Throne, and Give a Horse a Place to Roam. When designing the LiveGreen collection, Pioppo felt compelled to use recycled gold because there is no environmental destruction, no contaminated fresh water, and no displaced communities harmed during the mining process. Pioppo believes in karma, making it a point to give back to the universe for her life's blessings. "I am motivated to share my energy, giving back to the organizations that channel their efforts into guiding us to take action in ways that make a difference in our world. This is one of my passions. What we do matters", says Pioppo. "Each of us does our part in contributing in the ways we know how. I convey the message through this medium. Creating something beautiful that serves as a reminder to choose to live consciously". "Congratulations" to VIP Club member #17, Jill Hendrickson! 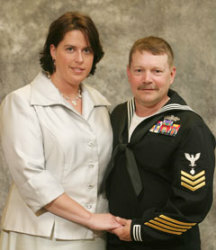 Jill resides in Rosemount, MN with her husband, U.S. Navy Reserve Officer, Ken Hendrickson. Jill recently posed for an official Navy Ball photo with her husband, wearing her Kenneth Fron "princess diana" necklace. Ken Hendrickson was featured on the BUZZ page Sept. 9, 2006 when his Humvee struck a roadside bomb on the call of duty and had to undergo a series of surgeries. Jewelry has become more than just a fashion statement. It is now very often a method used for fight various causes and raising money for charity. The latest jewelry collection to hit the jewelry "cause" circuit (and you may notice I finally added a Jewelry for a Cause category on this blog) is jewelry to help with lunch cancer research. Now, supporting lung cancer research can be as easy as purchasing specially designed jewelry that benefits the cause. National Lung Cancer Partnership is offering a bracelet of Swarovski crystals and two tasteful lapel pins to help raise awareness of the number one cancer killer while bringing in sorely needed funds for research. The jewelry can be purchased at http://www.nationallungcancerpartnership.org with all proceeds directed to the funding of lung cancer research and education. The lung cancer awareness bracelet is a stylized combination of Swarovski crystals of varying sizes and sterling silver beads. It has a sterling silver toggle clasp and a sterling silver ribbon. The pins being offered include one cast in pewter and finished in antique satin pewter, and a second of sparkling clear rhinestone crystals. National Lung Cancer Partnership was founded by physicians and researchers to support lung cancer research and education and specifically focuses on understanding how the disease affects women differently than men. "Lung cancer is often perceived as a man's disease, yet it affects tens of thousands of women, and we're very concerned that women seem to be in the dark when it comes to the facts about the disease and its prevalence," said Joan Schiller, MD, president, National Lung Cancer Partnership. "It is our goal to help women understand and be aware of their risks for lung cancer so they can be the best advocates for their own health." Awareness among women about lung cancer is low, according to Dr. Schiller. In a recent survey by National Lung Cancer Partnership, only 12 percent of women believe they know the symptoms of lung cancer and fewer than 10 percent said they have talked to their doctors about their risk for lung cancer. Only 36 percent of women were aware that lung cancer kills more women each year than breast cancer. The Swarovski crystal lung cancer awareness bracelet is available for $50. 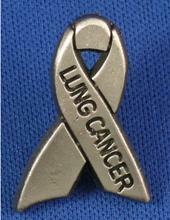 The pewter lung cancer awareness pin is $4, and the clear rhinestone lung cancer awareness pin is $5. National Lung Cancer Partnership is the only national lung cancer organization founded by physicians and researchers and focused on understanding how the disease affects women and men differently. The 501(c) (3) organization was founded in 2001. For more information, go to http://www.NationalLungCancerPartnership.org.